Before Kaspa arrived, life had changed considerably for Ken and Glenys. Glenys had begun to feel that their relationship was suffering as a result of Ken’s dementia. Often she would feel more like a carer than a partner to her husband of many years. Glenys, found leaving her husband at home increasingly stressful. Ken would become anxious the moment Glenys left the house and she found herself having to phone at regular intervals to reassure her husband. Since Kaspa arrived Ken is calmer and his anxiety levels have dropped considerably. He no longer feels alone as Kaspa sits loyally by his side, and the time seems to pass more quickly as he has his dog to occupy his mind and divert attention from being away from Glenys. This meant that Glenys could leave the house knowing that Ken would be safe, as Kaspa had been trained to respond to alarms that would remind Ken to carry out tasks, like take his medication. Kaspa’s presence has also helped in a similar way when the couple are out. Kaspa has full public access rights and has been trained to be an ‘anchor’ and settle quickly when in shops, restaurants and other public places. The fact that Kaspa sits still means that Ken is also content to sit with him. 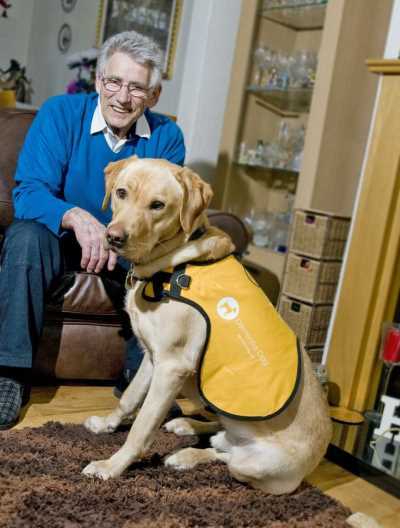 Kaspa is also a great ice-breaker for Ken, as people stop and chat to find out about his ‘special dog’. Having Kaspa around also lets people know that the couple might need a little extra help as they understand he’s a working dog. They are a well-known sight in the community and it’s reassuring to know that people will look out for them both. 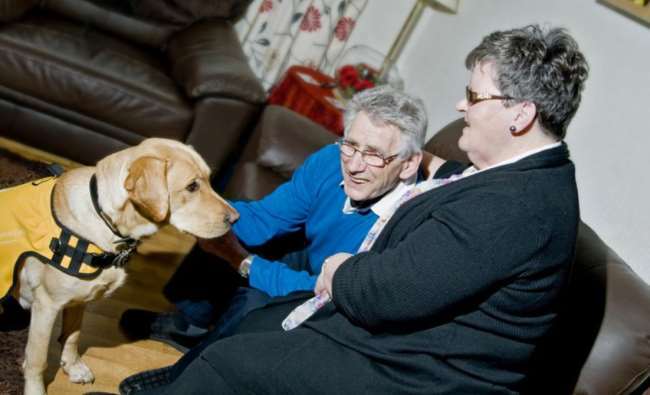 “Kaspa has removed my fear that Ken had gone, life is so much better for both of us now. Ken is happy and it has taken so much stress away from me as well. Every day we wake up knowing it’s going to be a good day thanks to Kaspa,” says Glenys. Dementia Dog is a collaboration project between Dogs for Good and Alzheimer Scotland and explores how trained dogs can help people to live well with dementia. Find out more.